As a follow-up to the many discussions we have had about too-high cesarean rates, we are talking about late complications from cesareans. Beyond the usual immediate surgical risks (infection, hemorrhage, anesthesia problems, blood clots, and accidental damage to surrounding tissues), many people don't realize that cesareans can cause problems in future pregnancies after the cesarean. All of these can be life-threatening to both mother and baby. Today we are going to discuss placenta accreta in all of its scary variations. How Does the Placenta Work? Before we discuss placenta accreta, it's helpful to know a bit about how the placenta implants and what it does. The placenta is like a trading post or interface where mother and baby exchange goods (nutrients, oxygen, and waste) back and forth. 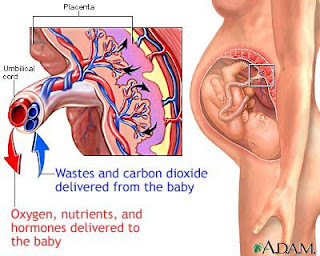 Essentially, the placenta performs the functions of lungs, kidneys, and digestive system for the fetus until it is born, not to mention supplying the hormones needed to support the pregnancy and being a filter to keep out most harmful substances. However, it's important to note that the baby's blood and mother's blood don't mix. 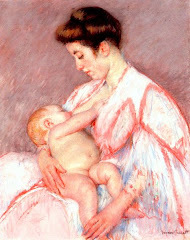 This is to keep the mom's body from treating the baby as a foreign invader and attacking it. 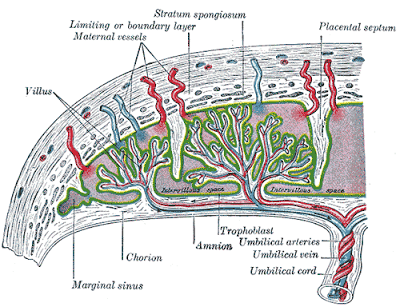 Mom's blood flows into the blood lake on her side of the placenta, which bathes the chorionic villi that are threaded through with fetal blood vessels. Small molecules and nutrients (like oxygen, glucose, vitamins, fatty acids, calcium, antibodies, and so on) flow from Mom to baby, and waste products (like carbon dioxide, urine, and metabolic wastes) flow from baby to mom. Weighing in at about 1 ¼ pounds when fully grown, the placenta works like a two-way filter. Stuff goes through it from one side to the other and vice versa. 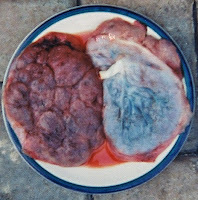 To the left, check out the picture of the the maternal vs. the fetal side of the placenta. Notice that the mother's side looks very different than the baby's side. The mother's side is very red and bumpy. This is where the lake of blood was and where most of the interface between mother and baby happens. The bumps and folds help increase the surface area with which the blood can interact. On the other hand, the baby's side looks smooth, shiny, and blue. The umbilical cord emerges from this side and takes the nutrients and other materials to the baby. So to summarize, the fetal placenta creates an interface with the mother where it interacts with the mother's blood without actually implanting into the muscle of the uterine wall. 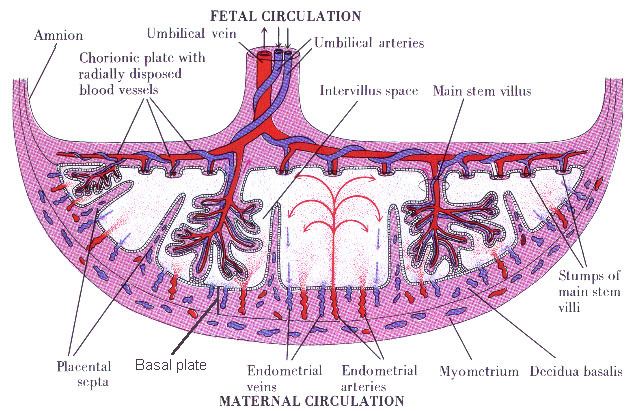 Once the baby is born, the uterus contracts, the placenta releases, and the maternal blood vessels shut off. Placenta accreta, on the other hand, changes this arrangement in key ways. Briefly put, placenta accreta is an abnormally attached placenta. Each month when a woman ovulates, the lining of her uterus (the endometrium) changes in anticipation of a possible pregnancy. If there is no pregnancy, this lining sheds via the woman's period. But if a pregnancy occurs, the lining of the uterus transforms, becoming the decidua. The decidua helps the placenta with the exchange of nutrients, gases and waste products, and helps protect the baby from the mother's immune system. The decidua also keeps the placenta from invading the mother's uterus. In placenta accreta, the decidua is deficient, allowing the placenta to attach itself directly into the maternal tissues. 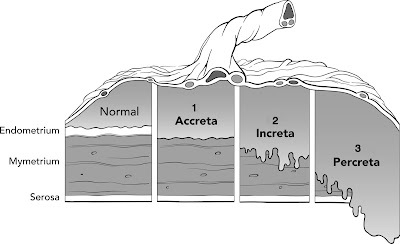 How deeply it attaches determines the severity of the accreta. 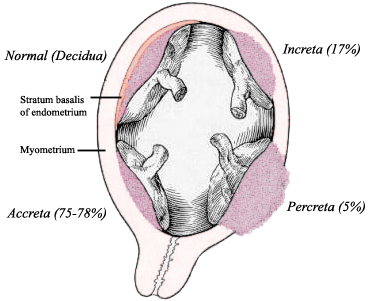 In an accreta, the placenta invades the deficient decidual layer and attaches to the wall of the uterus. Because of this, it isn't able to easily shear off and fully detach once the baby is born. In medical terms, the placenta is "morbidly adherent." In other words, it is stuck and won't come off easily, or may only detach partially. This is a problem because the open maternal blood vessels that feed the lake of maternal blood can't shut off. As a result, the mother can hemorrhage severely until the placenta is removed and the uterus behind it contracts and starts shrinking. About 75% of accretas are in this form, where the placenta is morbidly adherent to the uterus but has not grown deeply into it. In a more severe form, Placenta Increta, the placenta actually grows deeply into the muscle of the uterus. It is nearly impossible for these placentas to detach unless they are cut out. This can lead to massive hemorrhages that often necessitate a hysterectomy. In the most severe form, Placenta Percreta, the placenta grows not only into the muscle of the uterus but through the outer layer (serosa) and often into adjacent structures nearby. This is an extremely life-threatening situation because it can't be solved with "just" a hysterectomy; the placenta must be removed from other areas and any organ damage must be fixed. Percretas usually grow into the mother's bladder or bowels (which are the structures nearest most percretas) and women can suffer severe injury. Sometimes women even die from percretas. 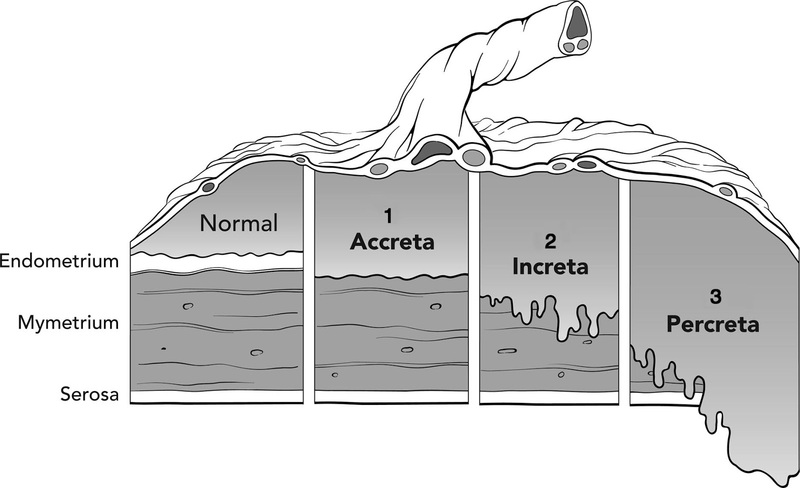 Placenta accreta comes in three levels of severity ─ accreta, increta, and percreta. Thankfully, most accretas don't involve an increta or a percreta. However, even without these severe forms, an accreta is still a very serious complication that has the potential to become life-threatening. Fortunately, foreknowledge of an accreta, careful management protocols, and being in the right delivery setting can significantly lower the risk for mortality and morbidity. So if you have been told that you have an accreta, don't panic. Chances are that you and your baby will be okay. However, you need to know that a significant blood loss is likely, a transfusion may be needed, and a hysterectomy is a distinct possibility (depending on the severity of the accreta). In the most severe cases, nearby organs may be damaged as well. Management and delivery in a large regional hospital with OBs that are very experienced with dealing with accretas will optimize your chances for the best outcomes. 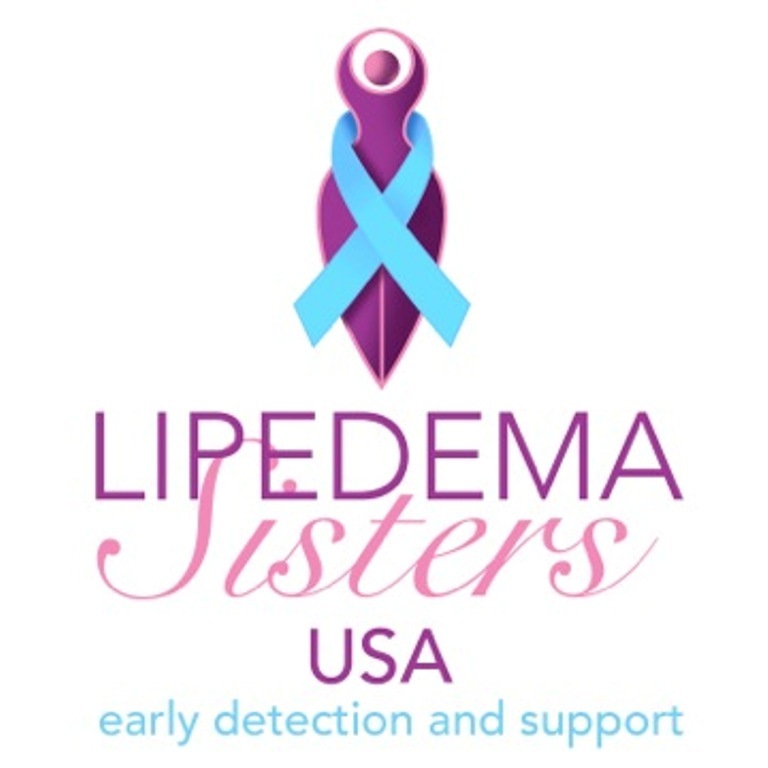 Sadly, the incidence of accretas has increased in parallel with the rising cesarean rate. This is because scarring and damage to the uterine lining during a cesarean predisposes to abnormal placentation. Indeed, the more cesareans a woman has, the higher her risk for placenta accreta. Some risk factors for accretas cannot be controlled, but a high underlying cesarean rate is a risk factor that is preventable on a population-wide basis, and routine repeat cesareans is a risk factor that is highly preventable on an individual basis. Placenta accreta is an extremely serious complication that is becoming all too common. A casual attitude towards cesareans, an over-utilization of them in low-risk mothers, and a lack of access to Vaginal Birth After Cesarean (VBAC) is part of the cause. This is yet another reason why reducing the cesarean rate and keeping access to VBAC is so important. Placenta accreta is an abnormal adherence of the placenta to the uterine wall that can lead to significant maternal morbidity and mortality. The incidence of placenta accreta has increased 13-fold since the early 1900s and directly correlates with the increasing cesarean delivery rate. The prenatal diagnosis of placenta accreta by ultrasound along with risk factors including placenta previa and prior cesarean delivery can aid in delivery planning and improved outcomes. Referral to a tertiary care center and the use of a multidisciplinary care team is recommended. ...METHODS: A retrospective review of all cases of placenta accreta and variants during the period of 1998-2002. Individual charts review followed case ascertainment via the hospital obstetric database. RESULTS: Thirty-two women with placenta accreta (or variant) were identified. Median maternal age was 34 years, with a median parity of 2.5. Seventy-eight percent of cases had had at least one prior Caesarean birth, and 88% of cases were associated with placenta praevia. Pre-delivery ultrasonography was performed in all cases, providing diagnostic sensitivity of 63% and specificity of 43% with a predictive value of 76%. Hysterectomy was performed in 91% of cases with median intraoperative blood loss of 3000 mL. There were no maternal deaths in the current series. CONCLUSION: A strong association between placenta accreta, placenta praevia and prior Caesarean birth has been demonstrated. As there is the potential for significant maternal morbidity the risk of placenta accreta needs to be recognised and women at risk should be considered for delivery at an institution with appropriate expertise and resources in managing this condition.